Shrewsbury Town manager Micky Mellon says that this Sunday's visit to his former club Fleetwood is no bigger than any other game in their fight to beat the drop from League One. The FA Cup giantkillers, who have twice knocked out Championship sides to set up a fifth-round tie with Manchester United, are 20th in the league. "The Fleetwood game coming up is massive for us," said Mellon. "But all the games are big anyway. None are bigger than any other," he added. 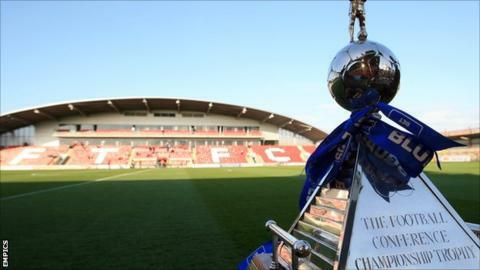 "Fleetwood have a couple of games in hand and we're fifth from bottom. But they all carry the same prize of three points and we just have to get as many points as we can, starting on Sunday. "We will go up there looking for a result and I will have the squad in the best possible mind to do that. You find out a lot about yourself. I have found that this season and I'm a fighter "
Tuesday night's 2-1 home defeat by Southend United means that Mellon's men have now not won a league game at the Greenhous Meadow in three months, since beating Bury on 24 October. But they have shown what they are capable of by enjoying away wins at Sheffield United, Crewe and leaders Burton Albion, not to mention winning at Cardiff in the third round of the FA Cup. And last Saturday's home fourth round-win over Sheffield Wednesday proved that his players do not hold any fears about playing at the Greenhous Meadow. "I don't know about welcoming an away game," Mellon told BBC Radio Shropshire. "I just know we need to stop switching off. There's not a lot I can do about Southend's winning goal. It's soul destroying. But, if we can perform like we have been, and cut out the silly mistakes, we'll be fine." Shrewsbury's FA Cup win over Sheffield Wednesday was their last game with chief executive Matt Williams at the helm prior to his move back to Lancashire to become general manager at Burnley. But, before he left, he told the latest Shrewsbury Fans' Parliament that the club's board have given Micky Mellon good backing. "We were promoted last season with the fourth highest budget in League Two," said Williams. "On promotion, the playing squad all received a 20% salary increase. It is worthy of note that our current wage budget is the ninth highest in the division, which illustrates the board's commitment. "We all acknowledge that Southend and Burton particularly have adapted to life in League One better than we have, but we would point out that both those clubs have assembled their squad over a period of time, whereas in Micky's first summer, he had to recruit 17 new players. "Losing Ryan Woods and Connor Goldson was a blow. The injury to James Wesolowski was another huge loss but I guarantee if you take three key players out of any team, form and performances will suffer."